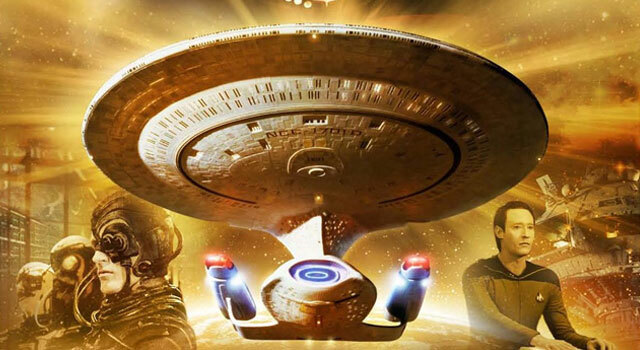 Following this week’s announcement and the unveiling of the official poster for the Star Trek: The Next Generation Season 2 Blu-ray theater event, promoter Fathom Events has released a complete list of participating theaters. Taking place for one night only on Thursday, November 29th, selected cinemas across the US will present two remastered episodes of TNG in celebration of the upcoming Blu-ray release. The episodes to be screened include “Q Who” and the world premiere of the extended cut of “The Measure of a Man”, which will include an additional 13 minutes of footage. Tickets will go on sale next Friday, November 2nd. NCM Fathom Events and CBS Home Entertainment are coming together again to celebrate Season 2 of the iconic series Star Trek: The Next Generation in a special one night big screen event. This not to be missed movie theatre event will feature two of the most popular Next Generation episodes, Q Who? and The Measure of a Man which will include, for the very first time, about 13 minutes of never before additional content. Set in the 24th century, The Next Generation was created by Gene Roddenberry over 20 years after the original Star Trek series. The Next Generation became the longest running series of the Star Trek franchise, consisting of 178 episodes over 7 seasons. Star Trek: The Next Generation – A Celebration of Season 2 is the first opportunity to see a transcendent digital presentation and the world premiere of the extended cut of The Measure of a Man in select movie theaters nationwide on Thursday, November 29th at 7:00 PM (local time). Full list of theaters below. Preorder Star Trek: The Next Generation, Season 2 on Blu-ray at Amazon.